Boerum Hill gallery 0.00156 acres is pleased to announce Centralia, a photography exhibition by artist Travis Roozée. 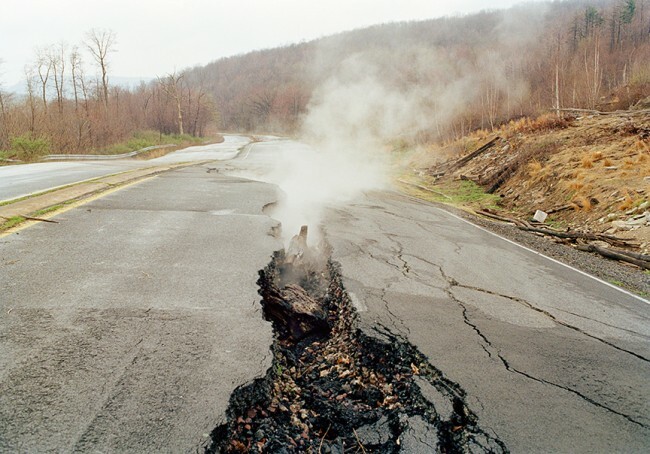 Roozée presents a series of photographs documenting an ongoing catastrophic event in Centralia, Pennsylvania. Centralia is the site of an underground coalmine fire that has been burning for nearly 50 years. It’s estimated that the uncontrolled fire – which started at the town dump in 1962 — could burn for hundreds of years. The fire ignited a vein of coal connected to an abandoned mine. In 1981, a young boy was walking through a neighbor’s backyard when the ground collapsed beneath him. He clung to tree roots in the carbon monoxide filled hole before his cousin pulled him to safety. In 1984, the U.S. government relocated most of the town’s 1,100 residents and razed structures there. But the fire burns on.